Gold ingots are ancient chinese gold medium for exchanging expensive goods. They are made to look like a smiley face because gold ingots trigger happiness when one sees it. Gold ingots have been designed by ancient Feng Shui masters with a perfect shape to emit wealth chi. They were owned in ancient times by high ranking officials, emperors and tycoons only. Gold ingots are highly recommended by all Feng Shui masters as the symbol of wealth and abundance. Gold ingots are also essential items for wealth ships and wealth vase. Gold ingots are essential energizers for wealth luck. 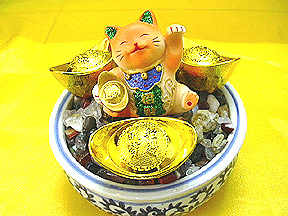 Wealthcat, gold ingots and crystal chips to create a "WEALTHBOWL". For illustration purpose only. The bigger the gold ingots, the better they are for you. Most gold ingots are carved with the chinese character "fuk"(fortune) to double the impact. 4. Display the gold ingots in the Northwest sector to activate your financial support luck for money finding opportunities. Note: Do not place gold ingots on the floor, toilets and kitchen.